Climate : Tropical. One hot humid season (October to April). One cool dry season (May to November). The best time to visit Madagascar is from May to December, when you can take advantage of the lower temperatures and sunniest weather. Madagascar has evolved into one of the world's most phenomenal destinations for natural history travel. 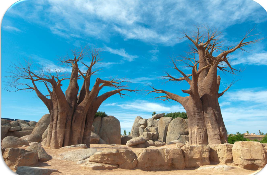 The world's fourth-largest island contains an immense diversity flora and fauna Of 12,000 plant species identified here, 10,000 are endemic to the island including seven of the world's nine species of the iconic Baobab tree, some Renowned national parks and World Heritage Site. Madagascar travel takes you through diverse habitats from 5.000 km of coastal line, 220 small islands to Bio-diversity hot spot. 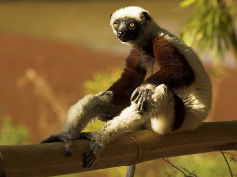 We seek out some of the 40 different species of lemurs, a primate group found only on Madagascar, and identify many species of chameleons in their wild habitat as well as some of the world's most bizarre creatures on Earth like the nightmarish hissing cockroach, so-called Dracula ants, and the Giraffe-necked weevil. Rich and fascinating culture, heritage today is composed of 18 different ethnic groups that derive from a long history of trade and migration from throughout Indonesia, Africa and the Arabian Peninsula, all united today in a common Malagasy culture and language. Legendary hospitality of the Malagasy population. Madagascar have a lot of precious stones as well. These tropical islands off the northwest coast have some of the region's finest beaches. Most accessible on Nosy Be is Andilana, the northernmost beach. Don't miss the day trip to beautiful, reef-ringed Nosy Tanikely, a marine reserve with a lovely, sunny beach. Nosy Komba has a good, small beach near Ampangorinana village. There are real gems further afield on Nosy Iranja (the 'turtles' island) and in the Mitsio Isles. Along the west coast, there are a number of secluded, palm-lined coves, off which to swim and snorkel and there is a stunning beach on the offshore islet of Ile Aux Nattes. The orchids are at their peak in September and the whales' migration takes place between July and October. . Its dense vegetation and the difficulty of navigating the lagoons which surround it made it an ideal base for pirates and, later, a colony for convicts. There are several historic sites, including Madagascar's oldest Catholic church (1837). The island is also known for its beautiful white-sand beaches and coral reefs. Ifaty has a pleasant beach and easy access to the spiny desert. The coral reefs attract scuba divers and there is an excellent PADI diving centre. The offshore islet of Nosy Ve is a terrific place for snorkelling and most people enjoy spending the day on a tiny desert isle. Another attraction is the graceful tropic birds who breed on Nosy Ve. Madagascar is legendary for its profusion of wildlife and flora, 80% of which is found nowhere else on earth. 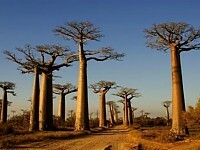 -10 families and 260 genera of plants are endemic to Madagascar. Only Australia (with 13) has more endemic species of plants. -An entire family of plants, the Didiereaceae is unique to Madagascar. Didiereaceae plants are found in the arid southwest and closely resemble some forms of cacti. Unlike catci though, they produce small deciduous leaves which are protected by meanacing thorns and spines that grow directly out of the plant's many branches. -95% of the species found in the Spiny desert exist only in this habitat unique to Madagascar. -Madagascar has nearly 1000 known species of orchids, of which 85% are endemic. -Anti-cancer drugs (vincristine, vinblastine) derived from the Madagascar rosy periwinkle generated over a billion dollars in revenue for Eli Lilly & Co.
Isolated from the continents 160 million years ago, Madagascar followed a unique evolutionary path into enormous tortoises, elephant birds, and lemurs. Lemurs were the highest primate form on the island until the Malagasy people, of Afro-Polynesian ancestry, arrived a mere 2000 years ago. The island of Ste Marie, off the east coast, is Madagascar's third scuba diving venue, of interest to wreck divers. Coral formations are at their best around the small island Ile Aux Nattes, to the south of Ste Marie, and include: The Pagodas, an accessible, large coral formation (to 12m) with rays, lobster, tortoise and the range of coral species; Off La Crique, Coco Bay (to 25m) has a variety of coral formations, pelagic fish and tortoises. Paroi des Merous (to 40m) , a site for experienced divers only, offers some exciting diving. Further north, around La Cocoteraie, Anivorano Rocks offers diving on granitic rocks with barracuda, (to 20m); the wreck of a fishing boat is an easy dive (15m) providing magnificent photo opportunities; and Pointe Alebrand (to 20m) is a beautiful dive, a sandy bed with granite boulders, grey shark, rays, barracuda. Humpback whales migrate past the island from July to October. There are also some good diving sites in the south of the island and dive operators operating there, mainly around Ifaty Toliara and Morondava. they have one world-class left, one almost as good, two other lefts, a right, and a peak - all within relatively short boating distances of one another. And you do need a boat to get to these places, most of which are between one and three kilometres offshore. With hundreds of kilometres of reefs, bays and points stretching up the Mozambique Channel, the southwest also holds the real possibility of many more surfing discoveries. South of Itampolo the coast swings east, increasing the exposure to the swells, and to the winds. The water is still warm and corals still grow, but the fringing reefs begin to break apart, opening the way for inshore setups. Rock shelves and beach breaks start to predominate, all easily accessible from shore. Lavanono there is one recognised left point break as well as dozens of other unnamed reefs, including many with real potential to turn it on in big swells. Heading north from Fort Dauphin much of Madagascar's East Coast could be described as a featureless wave desert. Long straight beaches tend only to be interrupted by river-mouths. North from Ambila-Lemaitso the coast gets more interesting and the opportunities increase. Coral atolls and reefs become more common-place, and the coastline starts to be broken up with points and bays. There could be dozens of quality waves along this largely unexplored stretch. Plenty of itineraries; you will be the one to choose once on the spot. They have a full range of hikes, treks that will allow you to discover this magnificent region of Madagascar : Andringitra. you will discover new landscapes: tropical humid or dry forest, savannah, palm trees. Antananarivo, often abbreviated to Tana, has a distinctively French flavor and atmosphere: French is widely spoken, and road as well as shop signs are mostly in French. The city is built on three levels. Dominating the city is the Queen's Palace and associated Royal Village or Rova Palace of Justice; Palace of Andafiavaratra . Now a national monument, it was once the residency of the Merina Dynasty which, in the 19th century, united all Madagascar for the first time. On the lowest level is the market of Analakely. The Tsimbazaza Zoological and Botanical Garden is open Thursday, Sunday and holidays 0800-1100 and 1400-1700. Spread across 152,000 hectares, the Tsingy de Bemaraha Strict Nature Reserve is located 60 to 80km inland from the west coast in the northern sector of the Anstingy region of the Bemaraha Plateau, north of the Manambolo River Gorge. Undisturbed forests, lakes and mangrove swamps are home to a variety of rare and endangered birds and lemurs. Rocky landscapes and limestone uplands are cut into large peaks with a mass of limestone needles. Rivers flow on the plateau and springs arise on each flank of the Tsingy, making this an important water catchment area. Ancient cemeteries can also be found in the Gorge. After years of turmoil Madagascar has finally found political stability and the Ministry of Tourism announced a plan to attract 1 million tourists by 2020. In order to achieve the goal minister Ramarcel Benjamina Ramanantsoa has launched a project that includes a number of measures to prepare the island to accommodate this massive number of arrivals. The plan includes $10 million investment in establishments that are safe, have attractive environment for business infrastructure and development.The government has launched an offer for major international hotel chains to make investments particularly intended to attract high-end tourism. The promotion focuses on other Indian Ocean islands including Comoros, Mauritius, Seychelles, La Reunion and Mayotte. The Royal Beach project is one of the examples that involved national and international investors and has received the support from the new government. Promotion of the destination is one of the main aims of the Government tourism development plan. Minister has suggested increasing the available budget to USD 300,000. The promotion involves a diversification of tourist attractions with an enhancement of ethnographic and cultural attractions of the country. The authorities also invest in training to ensure a high level of hospitality services to the visitors. Madagascar seeks to leverage its traditional resources, nature and unique ecotourism at the pristine beaches. Minister Ramanantsoa said: �We will put the emphasis on cultural tourism, starting from the rural destinations, creating �cultural villages� and involving local population.� The first two 'villages' will be created in Sainte-Marie and Nosy Be island, north of Madagascar, which is very well known as a tourist destination among Italians. According to the minister, the involvement of locals in the project of 'cultural villages' should, increase the safety of tourists. The local population will be at the forefront in protecting tourists because it will become a serious source of income. The ministry launched the promotion of twenty-one national parks and reserves which will be given concessions for investors. Madagascar has also started the creation of training centers to increase the level of services to the international standards. The minister is also planning to diversify the offers on the island. Madagascar is unique because of the diversity of species on the island and beaches, but these two offers are not sufficient to enhance the 'entire territory. The country has opened a new front by joining the International Surfing Association, which represents top destinations for surfing. Such a move brought good response both from private investors and traditional tourist markets such as Australia. (Forimmediaterelease.net) LOS ANGELES, California - L�Heure Bleue, the eco-chic resort of Nosy Be, in Madagascar, has been created as a model for sustainable tourism: Everything is designed from the outset, in a spirit of respect for the environment and sustainable development, in harmony with local people. This property offers true luxury � high quality services in a rare and lasting environment. L�Heure Bleue was recently awarded Green Globe certification. The second edition of the International Tourism Fair Madagascar 2013 opened in fanfare on 29th May at the Carlton Hotel in Antananarivo. The regional trade fair which is now earmarked as an annual Vanilla Islands event hosted by the sister island of Madagascar, is a showcase for the tourism attributes of all the six island member states. The colourful opening ceremony had several keynote speakers taking the podium to highlight the importance and raison d'�tre of the Vanilla Islands organisation. Mr. Eric Koller the Chairman of the Madagascar Tourism Board welcomed the over 400 invited guests, calling on all actors of the country's tourism industry to rally behind the Vanilla Islands banner to further promote Madagascar and increase its visibility worldwide. Mr. Didier Robert, the President of the Regional Council for Reunion Island then addressed the audience with a strong message of unity and the need for all member states to work together to further the aims of the organisation and to rally behind each member start to show solidarity and support. He proposed that the Vanilla Islands takes on the challenge of increasing visibility on key markets and adopt a charter to further the credentials of the islands' biodiversity and sustainable tourism practices. The President of the Vanilla Islands, Seychelles Minister for Tourism & Culture Alain St.Ange took to the podium highlighting the organisation's progress during his first year's mandate. He also pointed out the challenges ahead namely better air access and the need for tenacity amongst its member states. He alluded that the tourism industry is a complex one and that the rewards of hard work and determination are reaped further down the line. He cited the example of Seychelles which is now benefiting from double digit growth in arrival numbers for 3 consecutive years whilst other member states were having difficulty to sustain growth. He went on to stress the importance of all the islands working together and supporting each other to further promote all events and activities of each member state. He thanked everyone present for showing solidarity with Madagascar and strengthening their support for the Vanilla Islands Organisation. Malagasy Minister Jean-Max Rakotomamonjy then addressed the audience putting emphasis on the fact that the country needs to better understand the tourism industry. He stressed that government needs to provide the private sector with the right enabling environment to allow it to flourish and take its rightful place within the Madagascar economy. These keynote speeches were delivered in the presence of Ministers, ambassadors, dignitaries, VIPs, tour operators, travel agents and an important contingent of audio, visual and written press. The distinguished guests were then ushered to the hotel's mezzanine to assist the ribbon cutting ceremony which kicked off the official opening of the trade fair. Next weekend will see the second edition of the Madagascar International Tourism Fair take place in the island's capital of Antananarivo which has already since its inception received the full support of other Vanilla Island partners as a key event on the annual calendar of mutually promoted activities to promote tourism to the islands. "Showground: will be the Hoel Carlton in the capital, where a significantly higher number of attendees are expected this year. Madagascar is in fact hoping to make this fair the Indian ocean Tourism Fair of the Vanilla Islands regional body. Madagascar has been enjoying increased interest again and the island's tours industry is hoping that this event, combined with other high profile activities like the co-hosting of the Seychelles"
many attractions the island has to offer were largely laying idle.